The Reputation of the different Pineau des Charentes produced by Maison Brillet is long established. The quality has been renowned as amongst the best for many years and they have won many international prizes and medals for excellence around the world. Grapes are macerated and decanted after two days to produce a grape juice which just starts to ferment. At the end of the grape harvest, 75% of grape juice at 1% of alcohol is carefully mixed with 25% "eau de vie Cognac" at 71% of alcohol. Vine types: Saint Emilion des charantes also known as Ugni Blanc and Colombard for the grape juice and Ugni Blanc for the Cognac eau de vie. Ageing: Aged on lees for at least ten years. Tasting: Amber/gold in colour. 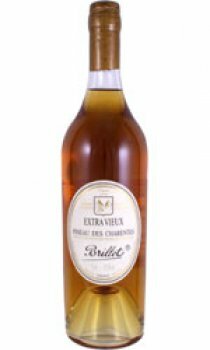 Subtle nose of honey, fruit in which the vitality of Cognac and the freshness of the grape juice are blended to create this nacter aperitif and desert wine, excellent consumed cold without ice before or during a meal with foie gras or blue cheese. International prizes: Silver medal 2005, Brussels and Gold Medal 2004 Montreal.